Flying through the blue skies above Homer, Alaska in the USA, this Bald Eagle finds something that catches his eye. A Bald Eagle is a beautiful bird of prey and Homer, Alaska in the USA is an exceptional place to watch these creatures flying aimlessly about. As this Bald Eagle spots something that he finds interesting, his whole flying pattern changes as he gets a closer look and decides whether it is worth diving at. The wing tips of this massive bird bend at the tips as to alter the direction that he his flying and the talons are always prepared to pluck their prey up off the water over Homer, Alaska. The look on the face of this Bald Eagle is definitely one that means business which will not disappear until he has completed the task at hand. 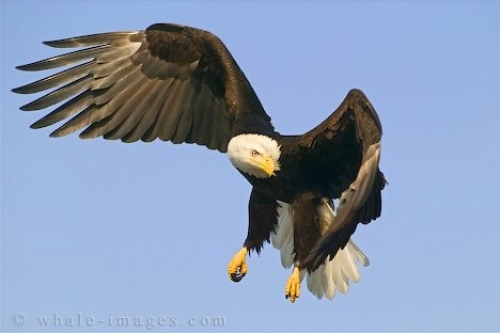 Photo of a bald eagle flying above Homer, Alaska in the USA as he spots something to his liking. Pictures from the collection "All Pictures"
... Facts say that a Bald Eagle can see four times better than a human which is unreal as one knows how well we can see. As well as great eyesight, they can also see straight ahead and sideways at the same time which is how they are so quick to pick up on prey while flying above. Homer, Alaska is one of the best places to watch a Bald Eagle in action as he swoops down upon its prey, soars amongst the blue skies or rests atop a tree. Winter is the best time to go to Homer, Alaska to watch the Bald Eagles as this is where they gather each year and there are locations marked out for the best viewing. Hicker's Alaska travel photos including all seasons in Alaska. You can add any of the above products to your shopping cart. All of our prints come masterfully printed on museum-quality archival paper, and every product comes with your satisfaction guaranteed! We usually ship within 48 hours!